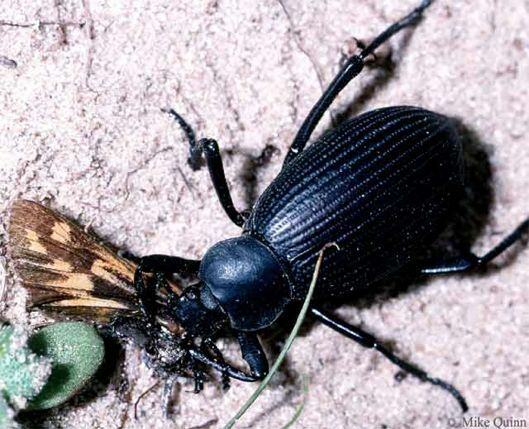 Darkling Beetle - Eleodes sp. 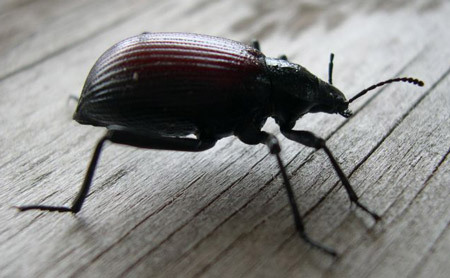 Similar Species: There are some 129 species of Eleodes divided into 14 subgenera in the western United States. E. acutus, E. arcuatus, E. carbonarius, E. caudiferus, E. debilis, E. delicatus, E. dissimilis, E. easterlai, E. extricatus, E. fusiformis, E. goryi, E. gracilis, E. hispilabris, E. knullorum, E. labialis, E. longicollis, E. mirabilis, E. neomexicanus, E. nigrinus, E. obscurus, E. opacus, E. pedinoides, E. spiculiferus, E. spinipes, E. sponsus, E. striolatus, E. suturalis, E. tenuipes, E. tricostatus, E. veterator, and E. wenzeli. Blaisdell, F.E., Sr. 1909. A monographic revision of the Coleoptera belonging to the Tenebrionidae tribe Eleodiini inhabiting the United States, Lower California, and adjacent islands. Bulletin of the United States National Museum 63: 1-524.